At least 34 Libyan pro-government forces were killed and 100 wounded in clashes with Islamic State group jihadists as they prepared for a final assault on the jihadist stronghold of Sirte. It was one of bloodiest days since forces loyal to the Tripoli-based Government of National Accord (GNA) launched an offensive in May to retake Sirte from IS. The fighting came as 29 people were killed and dozens wounded further west in the town of Garabulli when a blast ripped through an arms depot after militiamen and armed residents clashed yesterday. The fall of Sirte would be a major blow to IS which has faced a series of setbacks in Syria and Iraq where local forces and a US-led coalition are pressing an offensive against their positions. A statement by the GNA said yesterday's fighting took place in several parts of Sirte, where jihadists are pinned down in pockets of the coastal city. Speaking from the western city of Misrata, the source said the death toll had risen from 18 to 34, with the number of wounded increasing from 70 to 100. It was one of the heaviest tolls since the pro-GNA forces launched an offensive in May to dislodge IS from Sirte -- hometown of ousted and slain dictator Moamer Kadhafi which IS seized in June last year. The GNA forces earlier said "dozens" of IS fighters had been killed within 24 hours. They also announced their "intelligence network is in full swing in preparation for the decisive battle" against IS fighters in the city, after repelling multiple counter-attacks. 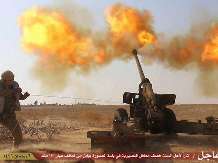 The statement said fighters were targeting IS-held areas of Sirte with heavy artillery while loyalist aircraft were carrying out sorties every day to strike IS or carry out reconnaissance missions. IS fighters "are besieged in a small area of Sirte and although they have sought to break out our forces have repelled all attempts," the statement said. It said that the jihadists had barricaded themselves in residential buildings and deployed snipers and explosive devices to fend off pro-GNA forces. IS has hit back with a string of suicide car bombings in a bid to defend their stronghold on the Mediterranean coast. Around 200 loyalist troops have been killed and hundreds wounded since the start of the offensive to capture Sirte, 450 kilometres (280 miles) east of Tripoli. An unknown number of jihadists have been killed. Libya has been awash with weapons since the 2011 uprising that toppled and killed Kadhafi, with rival militias fighting for control of its cities and oil wealth. In Garabulli near the Libyan capital, armed residents stormed an arms depot after clashing with a militia from the western city of Misrata which owned the weapons store.